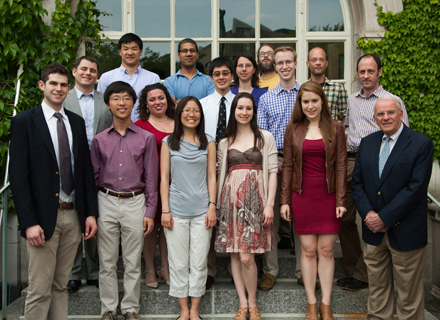 Eight undergraduates concentrating in Chemical and Physical Biology (CPB), Molecular and Cellular Biology (MCB), or Neurobiology received awards for their theses in May 2013. The John E. Dowling Thesis Prize was established in 2012 to commemorate the retirement of Harvard scientist, teacher, and Neurobiology Head Tutor John E. Dowling. This award marks outstanding scientific achievement in the field of Neurobiology. The awardee receives a framed certificate and a $500 prize. The 2013 John E. Dowling Thesis Prize was awarded to Emily Breslow for her thesis “Sensitivity of Human Circadian Clock to Phase-Resetting Stimuli: Interactions of Melatonin, Light, and Sleep.” Emily performed her thesis research in Professor Elizabeth Klerman’s lab in the Division of Sleep Medicine at Brigham and Women’s Hospital. The Lawrence J. Henderson Prize is awarded to the student who submits the most meritorious thesis to the Board of Tutors in Biochemical Sciences. The recipients receive a $500 book award, a framed certificate, and a copy of “Fitness of the Environment” by Professor Lawrence J. Henderson (1878-1942). The 2013 Lawrence J. Henderson Prize was awarded to James Meixong for his thesis “The critical role of host lipid metabolism in determining the infectivity of Hepatitis C virus”. James’s research was supervised by Drs. Raymond Chung and Lee Peng, who are both affiliated with the Gastrointestinal Unit at Massachusetts General Hospital. The Bowdoin Prizes recognize “essays of originality and high literary merit, written in a way that engages both specialists and non-specialists”. Established in 1810, the Bowdoin prizes are considered among Harvard’s oldest and most prestigious student awards, and have been awarded to many notable Harvard students, including Ralph Waldo Emerson, Arthur M. Schlesinger, and John Updike. There are two categories for the undergraduate prizes: the Bowdoin Prize in the English Language and the Bowdoin Prize in the Natural Sciences. Each winner receives a cash award of $10,000. CPB concentrator Katherine Xue was awarded the 2012-2013 Bowdoin Prize for her essay “Polyploidy in Arabidopsis arenosa: A case study in the Evolutionary History of Natural Variation”. The essay was adapted from her senior thesis, which is based on research she conducted in Professor Kirsten Bomblies’s lab.